Energy! Action! Finally! Plus high voltage socializing — and situations finding shape, contours, parameters. Really? Yep. Learn more in the Astro-Insight podcast for June 1-7, 2015 (5:53 minutes) and forecast for June. June sends us forward and backward with a force fit for New Year’s Eve. Just as the signal approaches to gun our engines, at last, unfinished business comes calling with dollar signs and repercussions. Which way to go? There’s the paradox. Progress will occur, but with the weight of the past dogging us – until we turn and deal with it, once and for all. The month begins with high energy and, likely, some of the brightest spirits we’ve enjoyed all year. Those levels promise to stay up all month. From the Sagittarius Full Moon on the 2nd on, fire is running throughout the sky, stoking life force and enthusiasm, fueling showmanship and playfulness, and causing sparks of emotion (anger, maybe?) to flare into into acts of passion, rebellion and liberation. The vibe amps up when Venus moves into Leo on the 5th, bringing relationships center stage. Think glitter, champagne, gold jewelry at the beach and a willingness, nay, demand for attention. The shift bodes well for fun in the sun and a general desire to socialize — and to go for what you want, without apology. Our interactions — and our divine right to be paid — will take on playfulness, showiness, grandeur, generosity and sometimes a bit of brattiness. We won’t see much of that last side at first. With Venus in a free flow to Saturn (June 6), a responsible, regal, even grown-up approach will prevail, encouraging many a developing relationship and financial deal to find solid, reliable parameters. Folly comes later, when Venus goes retrograde near the end of July. The fire impulses converge in a forceful, cathartic forward push acting on — or leaping from — the turmoil of March through May. The shockwaves are over, mostly, and we’re taking crazy bold action. This flavor of frustration, motivation and zeal has banked and subsided twice before, late last September and early in March. Third time’s a charm, the saying goes, and this blast has a streak of “and I really mean it!” that’s bound to propel us finally, dramatically forward. Jupiter is blessing the dice as he moves into a third, life-changing trine to Uranus, the agent of unpredictable change (exact on June 22). Minds unlock. Shackles fall from ankles. Fuses ignite, and we’re all human cannonballs hurtling forward. Relationships rock and roll, too, when Venus plugs into the Uranian circuit on the 29th. Resistance is futile. We’re been waiting for this. It builds all month, and where it takes you is downright exciting — probably in a good way, too. While fire burns away the past and propels us forward, other influences complicate the picture. The second week of the month brings a peculiar push-pull. Mercury goes direct on June 11, ending a retrograde cycle that began May 19. Before he gets going and communication has a chance to return to something resembling normalcy (as if such exists), Neptune stations retrograde, the following day. With the clouds of confusion coming off this, we could all feel unmoored and woozy for a few days. Those undercurrents pervade the Gemini New Moon on the 16th. It subtly refreshes mental energy and encourages chasing bright shiny objects, but with notes of seriousness, caution and awareness of the cost. Taking responsibility for what goes in and out of our heads is one theme. People who’ve been acting like adolescents may realize they’d rather make like adults now. Summer officially begins on June 21, when the Sun enters Cancer. The day’s chart sets the tone for the season. It’s complicated, requiring choices involving maturity and responsibility, and others pitting garden-variety desire against primal, sublingual gotta-have-it impulses. Fortunately minds and hearts are fused, and we’re all emboldened by the self-actualizing, “I gotta be me” imperative of the Jupiter/Uranus trine, which peaks the following day. Mars enters Cancer three days later, on the 24th, and brings a nesting, nurturing, emotional quality to our actions. That could cushion the impact of our actions. It could also make some people sensitive and crabby. Act as kindly as you can. Set your sights to the future and wish for the best. Keep Astro-Insight going. Contribute a cup of coffee, or a basil plant, or maybe some sunscreen. Make a donation via PayPal to kbiehlATempowermentunlimited.net (and replace “AT” with @). Thank you! Complex blend, this week: changes of heart, walking our talk, and hitting greater self-knowledge…against a backdrop of Mercury retrograde follies and basking in healing waters. Learn more in the Astro-Insight podcast for May 25-31, 2015 (6:07) minutes and forecasts for May (full and flash). Keep Astro-Insight going. Even $1 makes a difference. In fact, recent stats made me realize that if the people who download my podcast from only ONE of the hosting sites contributed $1 a month, that would cover my entire office overhead. Make a donation via PayPal to kbiehlATempowermentunlimited.net (and replace “AT” with @). Thank you! Here we go! A doozie of a Mercury retrograde is with us from May 18 – June 11. This retrograde is taking place in Mercury’s home sign of Gemini, aka Communication Central, which will make the snafus all the quicker. He’s also making hard contacts to Neptune, the planet of illusion, and Chiron, bringer of healing, which will escalate confusion and delusion. 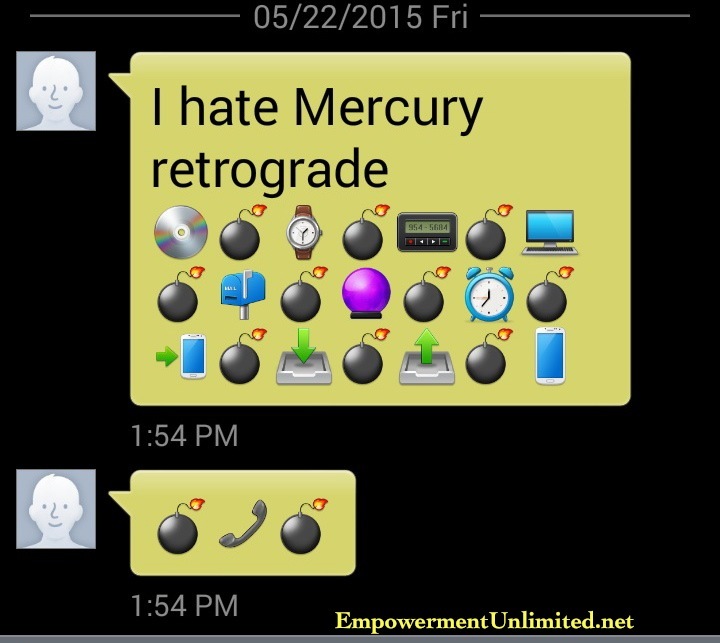 Read more in my article Handling a Mercury Retrograde. The replacement base for my Magic Bullet fruit extractor smoked on its first use out of the box. As in, wispy white stuff coming off it. The seller of said base says he’s heard about this from other customers. His explanation is oil on the motor. The Magic Bullet customer service people think something different — that the earlier blades are not compatible with the new replacement base. All the messages disappeared in my email folder for a publication I write for. Posting photos on my Facebook business page is a game of roulette. Sometimes they post; mostly site hangs up. Personal page posts go through without problem. I will be adding to this list as the retrograde goes on. Feel free to add your experiences in the comments. The Taurus New Moon invites us to sink into the physicality of the here and now. This year’s model is hardly stuck on the earth plane, though. This Moon takes us far from the surface in both directions, lifting us into transcendence (or escapism) while stirring the most primal of cravings deep within. Focus is now flowing to resources that nourish and support our existence, and all the better if they delight us, too: Aromatic flowers and herbs. Fresh fruit that explodes with flavor and juiciness when you bite into it. Sensual fabrics and, of course, sensual touch. Don’t forget cash, too, not merely to pay us for our talents, but also to make it possible to acquire the delights we can’t produce on our own. It’s the most natural, organic course of action to immerse yourself in any or all of these at the moment. The ruler of Taurus is encouraging it, too. Venus is currently in the sign of Cancer, which equates the sharing of food with love and emotional support. She is also in cahoots with two greater forces that are making these delights far more compelling (and irresistible) than normal. We’re experiencing them with not just our bodies, but also our hearts (or maybe, to be honest, wishful thinking). They’re all cloaked with something akin to love, or romanticism, or outright escapism. The cloaking comes from a link between the rulers of earthly and higher love. Venus is in the throes of a free flow of energy with Neptune, which is softening our vision and encouraging viewing everything in the best possible light. We could be deluding ourselves, but we don’t care. With this, physical experience is a delivery system for heaven on earth. We find it in a sunset, in a fresh strawberry, in another person’s eyes. It’s not all comforting sweetness, though. Some of the itches we’re feeling are downright devilish. That comes from the tension growing between the two planets of desire and money, pitting the earthly against superhuman, primal, even subterranean levels. Venus, representing the mere mortal experience of desire and money, is moving into an opposition with Pluto, ruler of the deep, dark and reptilian urges. This link is quite different from the harmony Venus is experiencing with Neptune. Oppositions present the challenge of finding meeting ground. Some of what we want, we want irrationally, obsessively, cellularly. The intensity and force of the tractor beam could be frightening. Yet as pulled as we feel, we’re also in for the frustration of not entirely making contact — and nothing ups desirability than being out of reach. Triangulation will be everywhere. If a third party is in a situation, it could squelch fulfillment — or make the fruit all the more tasty. Whatever is being stirred up now has been building for months. It grows out of the final foundation-altering clash of Uranus and Pluto in March and the emotional backwash of April’s Scorpio Full Moon. As with the link to Neptune, your conscious will isn’t in power or control. The most intense of your desires and monetary impulses may or may not be fulfilled. If they are, likely that won’t happen on your time table. Enjoy the bounty that is already in your garden. Everything else, hand over to higher guidance and forces greater than your will. Focus instead on what is before you now. Simple pleasures can be exquisite. Celebrate those, and allow yourself to be surprised about the rest. Keep Astro-Insight going. Even $1 makes a difference. In fact, recent stats made me realize that if the people who download my podcast from only ONE of the hosting sites contributed $1 a month, that would cover my entire office overhead. Why not thank me with a cup of coffee? Make a donation via PayPal to kbiehlATempowermentunlimited.net (and replace “AT” with @). Thank you! And so begins another Mercury retrograde. Hearts have quite the journey, too. Pay attention to cravings – and desires that don’t find fulfillment. Learn more in the Astro-Insight podcast for May 18-24, 2015 (7:58) minutes and forecasts for May (full and flash). Learn more in the Astro-Insight podcast for May 11-17, 2015 (6:05) minutes and forecasts for May (full and flash).